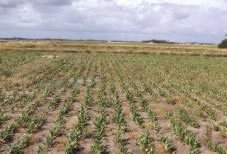 Our major concern lies on the selection and breeding of the established saline crops : Salicornia and Aster tripolium lines as well as the new crops under investigation. Different applications in "animal feed" , "environmental issues" or "cosmetics" are considered. Several types of cultivation technologies have been built up for open soil cultures and greenhouse cultures. Cultures were established in natural saline soils or artificial systems (hydroponics) Automation in harvesting sea vegetables has been setup. an EU Cost action (FA0901). Putting Halophytes to Work - From Genes to Ecosystems.